In our last post, we walked through the typical CPG customer journey: Awareness, Consideration, Purchase, Experience and Advocacy. Understanding this journey helps manufacturers know how they can influence their consumers to increase sales. Now, it’s time to help you customize and curate the experience you want your own customers to have throughout their journey. Let’s get started! The idea of securing long-time customers through an optimized customer journey is likely very inviting. But in order to conceptualize your own customer journey, first you must get familiar with your actual customer. Understanding your target buyers’ shopping habits, preferences, and existing brand loyalty will help to not only build your customer journey map, but will also provide helpful hints towards structuring marketing materials, packaging, pricing, trade promotions, and more. Once you’ve crafted your personas, the next step is to understand how each persona would think, act and feel during each stage of the customer journey. As discussed above, the typical CPG customer journey is Awareness, Consideration, Purchase, Experience and Advocacy. For each of these stages, define the key behaviors you want each buyer persona to make or goals you want to achieve. You’ll also need to define how you’ll measure progress. For example, in the Awareness stage, the most prominent goal is having customers take notice of your brand or product through some sort of traditional advertising or digital media. The metrics to measure progress toward this goal might be digital ad click-through rates, traffic to your website or coupons downloaded. In the Consideration phase, your buyer must decide to move forward with purchase. The goal is to give them enough convincing information to prompt them to make that conversion. For customers with dietary restrictions or other type of nutritional preferences, that might mean providing them with information on your product’s ingredients or specifications. Using your pre-made personas, understand what information a shopper would be most interested in finding, and provide that through social media posts, blog posts, forums, and so on. You can measure engagement in this stage by tracking social media followers, questions asked or visits to a FAQ page. 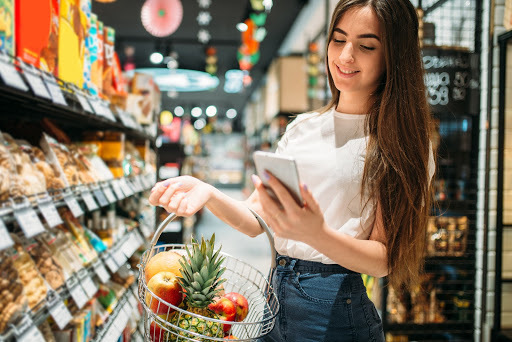 From here, a customer who has made the decision to move forward with Purchase can enter their local grocery store and complete the conversion. As a brand, your goal here is make your point of purchase as optimized as possible, such that nothing can hinder that conversion process. This could mean ensuring proper shelf placement or verifying trade compliance. Once you’ve mapped targeted behaviors and goals to each stage, you’re ready for the next step in drafting the customer journey map, identifying touch points. A touch point is any point where you communicate with your customers. The longer your customer journey takes, the more touch points it will involve. Touch points can be digital, such as a social media post or text alert, or offline, such as a billboard or secondary display in the grocery store. Each touch point plays a vital role in converting a shopper into a buyer, so each must be considered carefully. For your next step, develop the first touch point at which your buyer persona will interact with your product. Your first touch point – the consumer’s method of awareness – should be directly related to your buyer persona and what they will naturally gravitate towards. For example, shoppers that are more concerned with savings or affordability will likely be looking in sales circulars or on blogs or forums focused on grocery savings. Investing in placements in circulars or in display ads on savings-oriented sites will help raise awareness by the correct target buyer, and guarantee that your consumers’ customer journey is off to a successful start. Determine subsequent points of interaction that an ideal buyer would progress through before making a purchase decision. As noted in the stages you’ve drafted, this will be where they go to find more information about your product, and where they go to purchase. Once a buyer has identified a need, consider what barriers or friction could occur to prevent them from continuing on the journey. For all product types, this can consist of digital touch points, such as negative online reviews, or discovering their favorite store doesn’t carry a product. For CPG and FMCG products specifically, alternate issues that could sway a purchase decision include out-of-stock products, errors in pricing, out-of-touch price points, and incorrect product placement on the shelf – we’ll touch on all of these issues soon. For a successful customer journey, a brand must identify each opportunity where a prospective buyer could encounter issues, and determine how they can be circumvented. Uncover any opportunities to optimize your point of purchase, and periodically revisit to ensure your buyers have a smooth experience with your product and brand. Customer journey maps are your brand’s way of getting into a customer’s head, understanding what they want and how they feel. When you map out your customer journey, take into account each bit of knowledge and insights you’ve gained. Having a thorough customer journey map allows your brand a complete overview of where and when customers are interacting with your business and where you need to invest money to achieve a continued flow of buyers from beginning to end. Is the Map Actually a Cycle? Above, we discuss the customer journey as if it is a straight line from awareness to advocacy. And while that is the case upon first interaction, it changes upon second, third, and fourth purchase. The path to purchase is actually a cyclical decision-making process that connects a need to what shoppers buy. Between awareness of a product and the actual sale, the point of purchase continuously plays the largest role in the decision-making process. Product placement, price, and availability can all influence a shopper’s motivation to purchase. The experience and advocacy of a product can remain the same, as can a buyer’s awareness and consideration of a product when a need arises. However, if when the buyer goes to actually purchase the product there is a shift on the shelf, the conversion can fall through. This is just one of the many reasons why, as a grocer-preneur, the point of purchase is the most important aspect of the sale.